Lookout Mountain’s thousand-foot deep gorge known as Cloudland Canyon is one of northwest Georgia’s better known attractions. Earlier called Sitton Gulch, after the State of Georgia acquired land from private owners and constructed facilities, Cloudland Canyon State Park was opened to the public in 1939. Originally 1,924 acres, over time the park has grown to be one of Georgia’s largest, comprising 3,538 acres of canyon, sheer sandstone cliffs, fast-flowing streams, waterfalls, wild caves and extensive plateau-top forests. Perhaps you’ve gazed at the spectacular view of the canyon from one of the overlooks on the rim, then hiked down to see the two waterfalls, traversing the infamous 600-step staircase in the process. While these may be its best known features, there is much more to see and do at Cloudland Canyon State Park! 64 miles of hiking trails, with 30 miles open to mountain biking, and 16 miles of horseback riding trails provide ample opportunity for exploring the park. The one-mile round-trip Overlook Trail is perhaps the park’s most used feature. It’s a fairly easy path leading along the canyon rim to two spectacular overlooks. The next most-used trail is likely the Waterfalls Trail, a rather strenuous 1.8-mile round trip hike that takes in both Cherokee Falls and Hemlock Falls, and involves the aforementioned 600 stairsteps. The moderate 2-mile Backcountry Loop Trail accesses the park’s backcountry campsites. After crossing a small hemlock-shaded stream, it climbs back up approximately 200 feet to the trailhead. One of the more popular hikes in the Chattanooga area, the West Rim Loop Trail was once voted by Backpacker Magazine as one of the top 10 hikes in the U.S. This moderate, 5-mile, lollipop-shaped trail splits off from the Waterfalls Trail, crosses Daniel Creek upstream from Cherokee Falls, and climbs back up to the west rim of the canyon. It then follows the rim to the hike’s farthest point, passing a number of great overlooks along the way. The farthest overlook is where the west rim of Cloudland Canyon meets the western slopes of Lookout Mountain. To the west lies the town of Trenton and the valley which runs between Lookout and Sand Mountains. The eastern view is of Cloudland Canyon, while the side of Lookout Mountain stretches away to the north. Continuing counter-clockwise, the trail follows the bluff for a ways before turning left and soon crossing a paved road which leads to some cabins, then uneventfully winding its way through plateau-top forest before eventually completing the loop section of the hike when it rejoins the earlier-hiked trail. This trail can rapidly become quite crowded. If you want a hike with a bit of solitude, you definitely want to start this hike early in the day. Since it’s such a popular trail and gets a lot of use, it’s easy to follow. There are several side trails along the way which come from campgrounds and cabins, but the intersections tend to be well marked, and the entire West Rim Loop Trail is well blazed with diamond shaped yellow markers. The Sitton’s Gulch Trail is a newer but also popular trail, which runs along the bottom of the canyon. This moderate hike of approximately 4.5 miles round trip takes you to the 90-foot-high Hemlock Falls without having to do a strenuous climb. Originally, this trail was only accessible by hiking down from the top of the mountain, which is still an option. But now, a trailhead at the mouth of the canyon allows the trail to be hiked in from the bottom. The trail generally follows alongside Sitton’s Gulch Creek, the epitome of a fast flowing mountain stream, and eventually rises to a higher elevation than the creek. Sitton’s Gulch Trail is easy hiking, as it’s primarily smooth packed gravel. There are a few inclines, but nothing especially strenuous. By the time you reach the turnaround point at Hemlock Falls in just over two miles, you’ve gained about 400 feet in elevation. Shortly before reaching Hemlock Falls, the trail comes to a stairway leading to a long L-shaped bridge which passes over the top of an unnamed waterfall. This is the official end of the Sitton’s Gulch Trail. From Hemlock Falls you can retrace your route back to the trailhead, or, if you’re feeling adventurous, you can climb the 600-step stair system you passed shortly before reaching the falls and continue on to the 60 foot high Cherokee Falls. You can even climb on up to the canyon rim to take in the view from one of the overlooks. The Five Points Recreation Area, a reforested former coal mining area, is a newer addition to the park, and, with over 23 miles of trail, is popular with mountain bikers, trail runners, and long distance hikers. The 14-mile Cloudland Connector Trail, beginning in the main area of the park, runs through the Five Points area and continues on to nearby Lula Lake Land Trust property. It’s a multi-use trail, open to hikers, mountain bikers and horseback riders. In addition to trails, Cloudland Canyon State Park offers backcountry and walk-in camping, tent, trailer and RV camping, yurt camping, cottages, a group lodge, picnicking, disc golf, fishing, caving and more. An interpretive center features a number of stuffed animals, such as a bear, an armadillo, a fox, and more, and possibly live animals such as opossums. A park staff person is usually available for questions. The center is usually open on weekends and sometimes weekdays during peak visitation periods. There is a $5.00 parking fee unless you have a Georgia State Park Pass. See a great park trail map here. A paper version of this map is available at both the Interpretive Center and the park Visitor Center. For more information, including directions and hours, visit the Cloudland Canyon State Park website. Bob Butters is an outdoor writer, photographer, and landscaper. A lifelong naturalist, as well as a hiker, mountain biker, and paddler, he has been exploring the outdoors in the Chattanooga area since 1980. 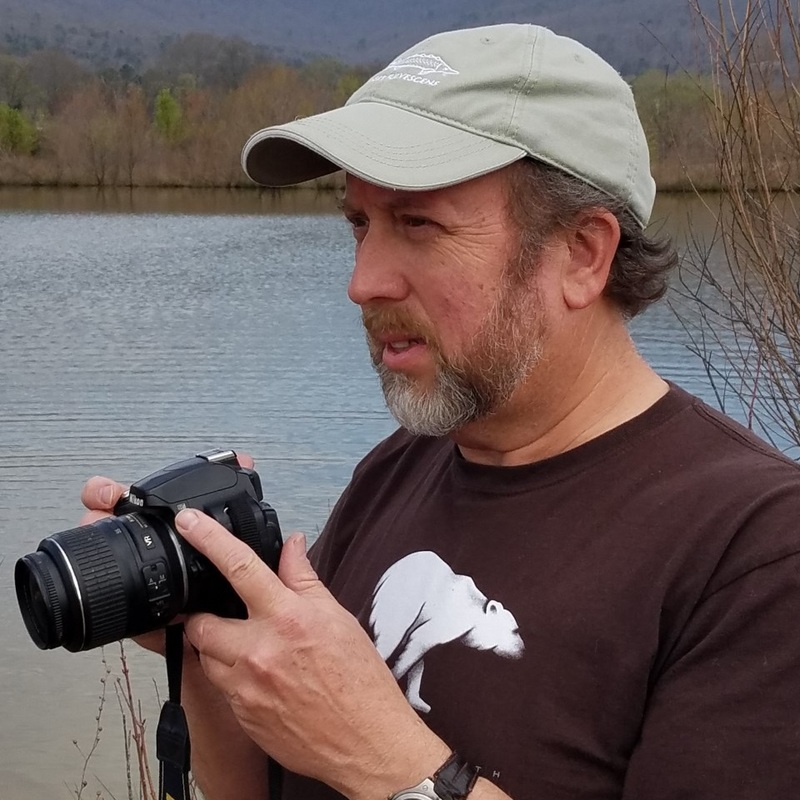 Bob lives with his wife in the beautiful Sequatchie Valley, just west of Chattanooga, and publishes the blog Nickajack Naturalist.